Certified coins, also known as ‘graded’ or ‘slabbed coins’, are coins which have been examined by a coin expert working for one of the incorporated grading services, identified and given a grade, then encapsulated in sealed and tamper-proof plastic. These certified coins are guaranteed to be what they claim, and to be of the grade stated on the capsule. You will often see coins advertised using the initials of the grading service. For example a coin might be described as PCGS MS69 (meaning certified by PCGS as being in Mint State, numerical designation 69) or NGC PF70 (meaning certified by NGC as Proof state, numerical designation 70). Coins are graded on a scale of 1 to 70, 1 being an almost blank disc of metal, and 70 being a coin which is absolutely perfect and unmarked (and usually rare in this state). The numerical scale is intended to bring some precision to the old coin grading descriptions, which were Poor – Fair – Good – Fine – Very Fine – Extremely Fine – About Uncirculated – Uncirculated – Mint State. Of course, even on the numerical scale, which has very elaborate divisions based on variations in coin marks and wear, many experts will assess the same coin’s grade differently, so grading is still more of an art than a science. Why would you want to buy or collect a certified coin? 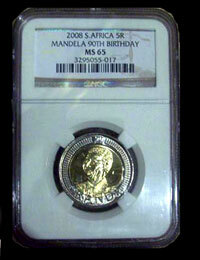 There are many reasons some collectors prefer certified and slabbed coins. First, gold coins (particularly) are expensive, and buying a graded and certified coin lessens the chances you are purchasing a fake. The coin is given an expert identification, if there is any doubt. The coin is graded, and often the grade of the coin will determine its value. All printed coin values refer to professionally graded coins, for example, not to your own guess about the grade of your coin. The coin is protected from any damage, even environmental pollution. It can be ‘handled’ without any worry. Finally, when you come to sell the coin, it will be easier to find a buyer. The slight disadvantage, of course, is that a certified coin will be more expensive to purchase than an exactly equivalent but uncertified coin.